Anyway since I’ve been too busy to blog (or make much food worth blogging) I might as well update y’all on the life happenings causing my absence from the interwebs… I’m planning my departure for an around-the-world trip! In 8 weeks my boyfriend and I are leaving the U.S. to travel for an relatively long chunk of time. First we’re traveling through Peru, Bolivia and Chile… Then I’m heading to Denver for Christmas… Then from Denver to Amsterdam to visit family there… And from Amsterdam we are heading to China. If that sounds like an incredibly ambitious itinerary and you think we might be nuts, you’re probably correct. But if the timing lines up in your life after you spend 3 years saving and only eating broccoli so one day you can afford this sort of thing and you’re going to go for it, well then you have to REALLY go for it, right?? 1. Please, please send me food and restaurant recommendations for Peru, Bolivia and Santiago?!?! Especially good meat-free options if anyone has experience being veggie and traveling in South America. If you’re interested in following my whereabouts on Instagram, you can find me @girlstirfried and/or @romaguire. Ok so now that’s out of the way, here’s a new recipe! This sauce is adapted from a tofu marinade recipe in the Thug Kitchen cookbook. Amazing book, by the way, if you haven’t seen it. Basically the only cookbook I own. 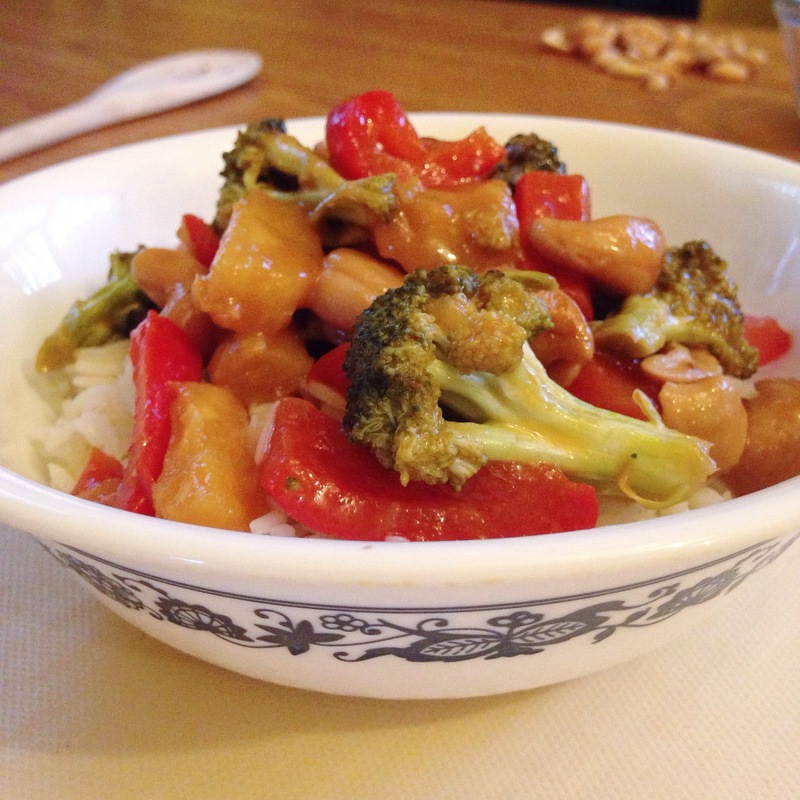 Anyway I changed the recipe up a little bit and used as a stir-fry sauce instead of a tofu marinade with some broccoli, red pepper, and cashews. I also threw pineapple in there because it sort of reminded me of a sweet and sour sauce, and I always loved the pineapple in there. It was a bit risky but I think it came out really nice! Hope you like it! First make up the sauce: combine the orange juice, soy sauce, sesame oil, agave, ginger, and sriracha in a measuring jug and whisk well. Set aside. Chop up the broccoli and red pepper. 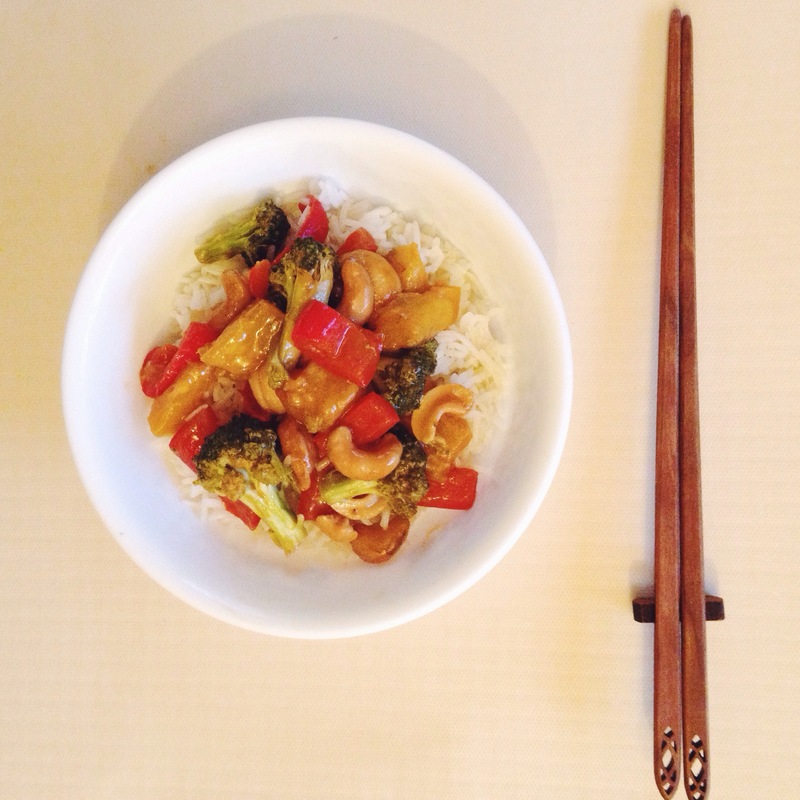 Heat up a wok with a drizzle of oil and add in the broccoli and red pepper. Stir fry for a few minutes, until they have softened a bit. Add in the pineapple pieces. Stir fry another 5 minutes or so, keeping the heat high and stirring around constantly. Pour in the sauce and add the cashews. Let cook for a few minutes, stirring a lot so the sauce gets on everything. Add in about a tablespoon of flour to thicken the sauce a bit and make it stick. Cook for another five minutes or so, until all the veggies are cooked. 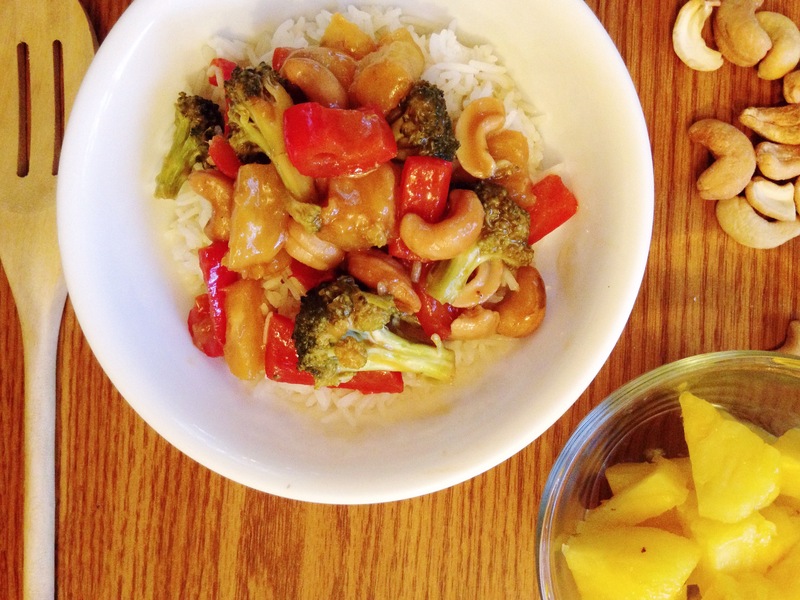 Serve over jasmine rice or another grain of your choice! missed your blogs girlstirfried ….. yum looks so appetizing ….pity it is my bedtime !